Interview and story by Budrick Bean Translation by Ellen C. Warren Photos by Jason Santiago, Orbit first, Orbit in orbit, Budrick Bean, author So, we’re heading toward Gordon Park and I’m thinkin’, “Alright! 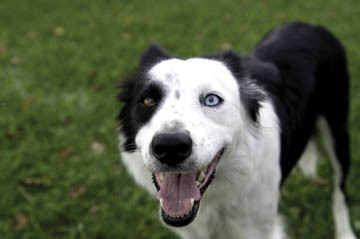 Mom’s gonna let me get some good rabbit-hunting in,” when she starts telling me how we’re going to be doing this interview of Orbit, the master Frisbeecatching dog. I do my best to pretend I don’t hear her, find even more delectable spots to sniff on the way, and hope that this Orbit doesn’t show. It’s not that I don’t like dogs, I just prefer the company of rabbits. I’m not too happy about having a job, either, though Mom’s wanted me to get one for a long time. Well, Orbit finally arrives. She’s with this guy named Steve Jennings, and she just can’t take her eyes off him. I don’t get it. Everybody’s always tellin’ me how handsome I am. She’s a real pretty 3-yearold girl – I’m not all that interested anymore at almost 13, but hey?! After the humans jabber a bit, this Steve pulls a Frisbee out of his bag and it all comes clear. She’s only interested in toys! Now, this I can understand. I used to be way into toys, too. Never as much as rabbits, but…. This girl’s world revolves (orbits? heh-heh!) around inanimate objects hurling through space! Now comes the demo. I’m a captive audience (leashed) so I just sit back and watch the show. She’s fast, a little black and white streak across the ground as she gains on the speeding disk and “pop!” she’s in the air grabbing it out of its flight! That time it was only a little higher up than a fire hydrant. The next one swoops upward and she jumps way higher than a tall human to grab it. Dog, she’s good! Steve tells my mom he’s throwing a “roller” to show-off Orbit’s speed. Her legs move so fast they look like a blur. Steve says she has an extra gear, whatever that means. Mom says “Hey Bud! You used to run that fast!” Gee thanks, Ma. Whenever Steve takes a break Orbit just stands there staring a hole through him. Apparently, border collies are known for this. The Stare. Now he sails one up that starts low, goes high, banks left, then right and arches down. Orbit’s out there in plenty of time following the Frisbee with her eyes, like she’s psychic about air currents. “Bang!” she picks it out of its speeding arc, her furry body curved like a “C.” Very impressive! I’m starting to get a little restless now, so we leave the humans to themselves and Orbit reluctantly drops the Frisbee and joins me for the interview: Buddy: How did he talk you into catching hard, potentially tooth-breaking disks? Orbit: Oh, I just love to play. I’ll play almost anything. Balls are my favorite. When he takes me to the park by the lake I always hunt down a tennis ball in the woods for him to throw. 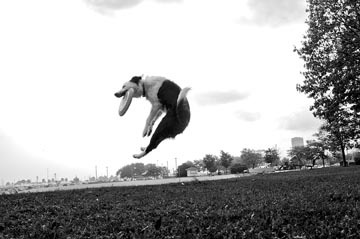 As far as the Frisbee goes, he started me on soft ones. But hard ones don’t scare me. I know how to catch them without getting hurt. B: What other sports do you play? O: Soccer. Basketball. I play defense. I can catch a football with my front paws. I even get involved in a pool game sometimes. B: Do you swim? O: Only to go get something out of the water. Not really big on getting wet. B: How come you have one blue eye and one brown eye? O: I don’t know. B: How do you feel about cats? O: Well, I lived with one for a while in some warm place. We ended up playing together. It was almost as good as a ball. But, you know, you got to chase the ones that run away from you. B: You seem kind of serious. Are you serious? O: Not serious, just focused. And amusing. Don’t you find me amusing? B: I’m asking the questions. Any kids? O: Steve says we’re going to wait awhile yet. B: Why does he call you “Orbit Wonder Rescue Dog?” Did you rescue somebody? O: No, no, no. He thinks it’s funny. I used to sit out in the yard in front of our house and people would think I was lost. I’m nice, so I’d go home with them. They thought they were rescuing me. And he’d have to come and get me. B: Hey, I do stuff like that. Any other weird memories? O: (pause) Well, there’s one thing I never quite figured out. One time I spent the night at Steve’s sister’s house for what humans call Christmas Eve. When Steve came he was upset. And then we never went back home. The humans said our house burnt down. And when we walked by later, I went up on the porch but it wasn’t our house anymore. That was very strange. B: I’m sorry. Sounds traumatic. Are things better now? O: Oh yeah. He’s always been good to me, but since then he even lets me go up on the couch! Well, I was about to thank her, but her eyes are fixed on the Frisbee in Steve’s hand, so I’m getting this leash off and taking my nose to the bunny-infested hillside. Just ask Orbit, it’s all in a day’s work. 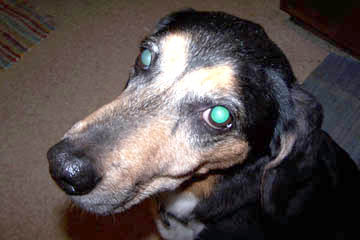 Known to his friends as “Buddy,” Budrick Bean is the 13-year-old companion of regular Currents writer Ellen C. Warren.